Native Range: South Florida in Miami-Dade County. Comments: We follow Nesom (2015) with regard to this use of this name versus Galactia volubilis as in Wunderlin & Hansen (2011) or Galactia pinetorum as in Herndon (1981). 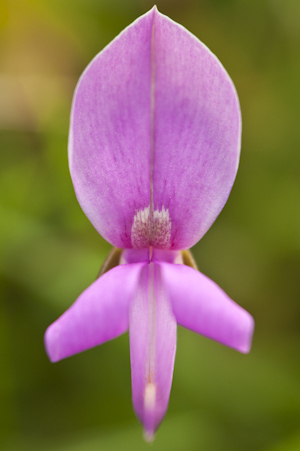 This is a procumbent (non-twining) Galactia with herbaceous, broad leaflets, 6–20 mm wide, without raised venation, and relatively large flowers, 10–15 mm long. Due to changing taxonomic concepts, we have modified several reports of this in Miami-Dade County from False to Reported (see below). Previous reassignments of some of these reports to Galactia pinetorum may have been in error and these reported occurrences are in need of review and documentation. See also the U.S. Fish and Wildlife Species Profile. Synonyms: Galactia prostrata; Galactia regularis of Wunderlin 1998, in part, not (L.) Britton, Sterns, & Poggenb. 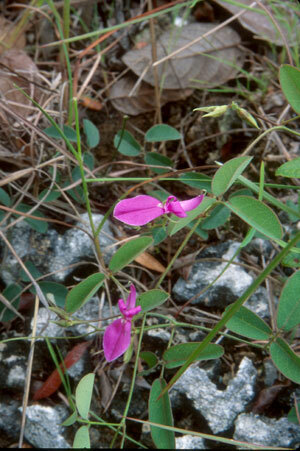 ; Galactia volubilis of Wunderlin & Hansen 2011, in part, not (L.) Britton.